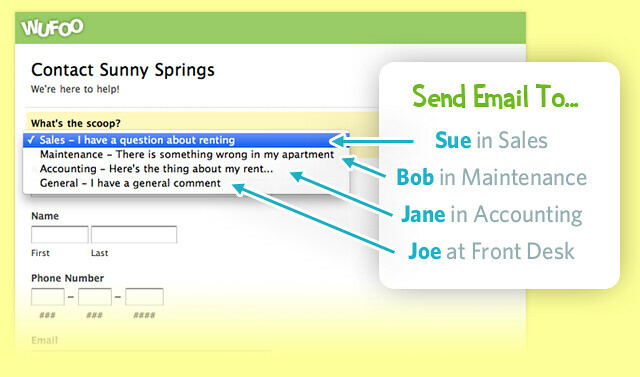 Customize the email notifications your users receive based on data they input. 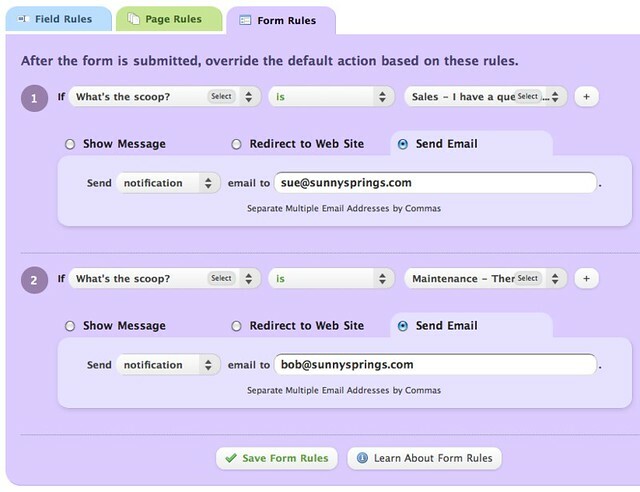 Using Wufoo’s Form Rules (available on any paid plan) you can easily set up your form to send email notification to particular people based on a user’s selection while filling out the form. Let’s do it! A dropdown menu or radio button field generally makes the most sense for this task. Add one of these to your form, and add the choices for the user to pick from. These should essentially be reasons why the user is filling out the form, which then map to individual people. Unless it’s an internal organization form where everyone knows each other, it’s best not make people direct choose which person it’s going to. Instead of creating regular email notifications for this form, which send to an email address regardless of any choices made, we’ll use Form Rules. Click the Rules button beneath the form you are working on from the Form Manager. Click the Form Rules tab, and then the Create a Form Rule button. Each choice you created in Step 1 will now have its own rule. Use the sentence-structure format to build the rule, matching the field and the choice. Then choose the Send Email option below that and enter the email address of the person who is supposed to get the email notification when that choice is selected. Go check out your form and try filling it out and submitting it. Choose “Sales” from the dropdown, then prairie dog out of the cubicle and yell, “HEY SUE, CHECK YOUR EMAIL, THE CONTACT FORM SENDS YOU SALES QUESTIONS DIRECTLY NOW.” She’ll love that.